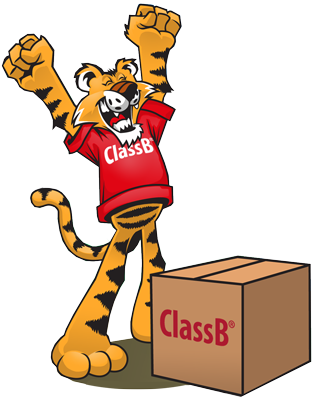 Ordering Lawn Care Company T-Shirts has never been so easy! 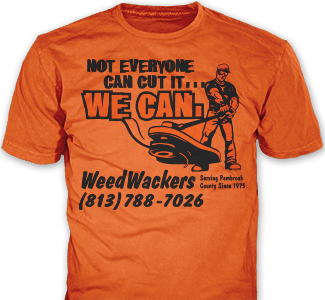 We know what makes great custom Lawn Care t-shirts for your company. Our staff are experts in custom t-shirts. 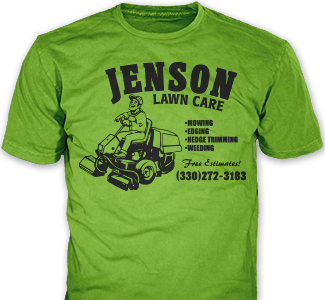 We will make sure your Lawn Care’s t-shirts are perfect! 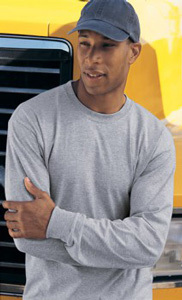 We offer wicking for those hot days and long sleeves for the sunny ones. 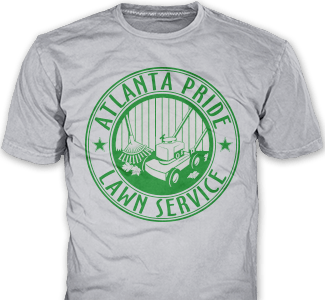 There are over 50 Lawn Care t-shirt design ideas to choose from! You can customize any design idea online. Can’t find exactly what you’re looking for or want something specific for your company? We also do fully custom designs for your Lawn company at no extra charge! 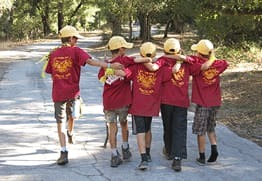 What makes our t-shirts look better than others? We pay special attention to our printing process! We make sure every logo and design element is perfect. 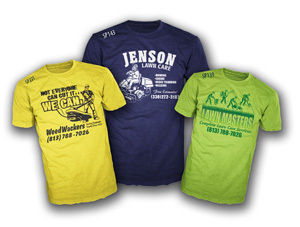 The design on your Lawn Care’s t-shirt represents your company’s services and professionalism! You crew will look respectable. 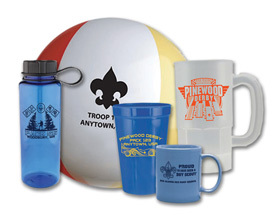 Save 15% off any Lawn Care related printing or embroidery order! See All Lawn Care Design Ideas! 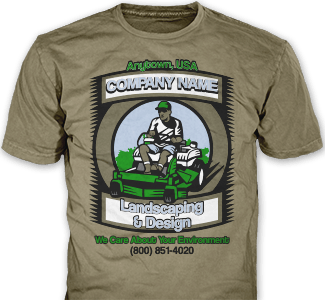 Your company will look great in their new Lawn Care company t-shirts! Quick Identification of your employees as lawn care and landscaping professionals will build trust in your clients and their neighbors. The best way to build business is by being seen on-site. 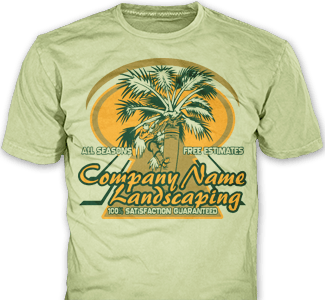 Custom Lawn Care Company T-Shirts will help you build your business! Be sure to buy extras since the shirts will get ripped, torn and stained. 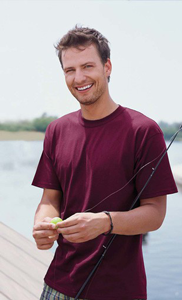 We used to recommend White shirts, but many companies are using color shirts to achieve a more professional appearance. 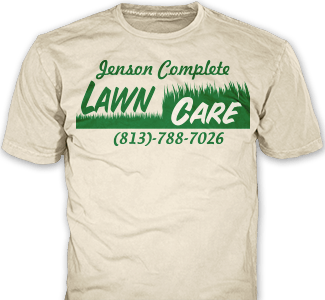 Ordering Lawn Care Custom T-Shirts is easy! 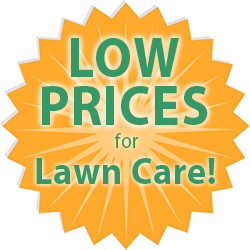 Low Prices For Lawn Care and Landscaping Companies! Pricing for Lawn Care T-shirts is based on a few factors: type of garment, number of colors in the design, number of sides printed. Always FREE artwork, setups, shipping. Large sizes like 2XL or 5XL never cost more! 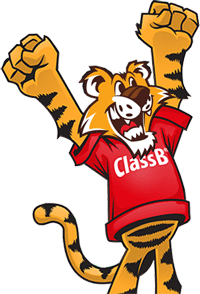 Convenient upfront price breaks that make it easy to understand the pricing model. Pricing is upfront so you can take it your Lawn Care employees and know exactly the price you’ll pay. 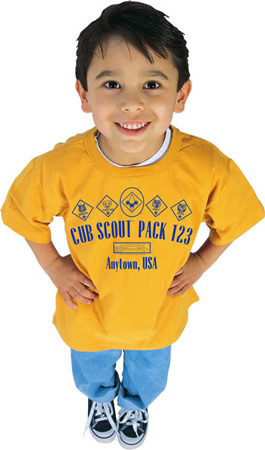 Default pricing is for 100% cotton, other garments can cost more. You can mix many different garment type to get better price breaks. It works as long as the ink colors do not change. We have 100% cotton t-shirts, hoodies, wicking shirts, sweat shirts and long sleeve options – keep your entire staff visually unified! 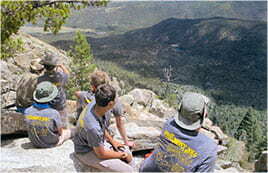 Prices vary – View each idea design and garment type of specific pricing.